AC Milan came from a goal down to beat Roma 2-1 in Serie A while Sampdoria missed the chance to return to the summit after being held to a 1-1 draw at Lazio. Elsewhere Atalanta and Catania secured their first wins of the season and Napoli beat Bologna. Alexandre Pato ended his scoring drought with the winning goal as Milan beat Roma 2-1 at the San Siro. The Brazil striker had not scored since his two strikes against Siena in the Serie A opener but he handed the struggling Rossoneri all three points. Jeremy Menez gave Roma a third-minute lead before Ronaldinho equalised shortly after the re-start from the penalty spot. Pato then made the most of a wonderful pass from Ronaldinho after 67 minutes to put the hosts in front for good. Leonardo's men were forced to play the last eight minutes of the game with 10 men after captain Massimo Ambrosini was shown a second yellow card for a foul on Nicolas Burdisso but held on for their third victory to climb to eighth in the standings. Lazio held on for a 1-1 draw against a battling Sampdoria with each team having a player sent off. 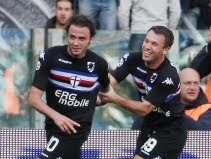 Giampaolo Pazzini opened the scoring for the visitors after 40 minutes before Francesco Matuzalem equalised shortly before half-time. After Marco Paladino picked up his second yellow card and was given his marching orders 10 minutes into the second half, the Biancoceleste failed to capitalise and were also reduced to 10 men when Roberto Baronio was sent off with 17 minutes remaining. Samp almost scored when Antonio Cassano hit the crossbar eight minutes from time but were denied a victory that has left them two points adrift of Serie A leaders Inter. Christian Maggio's injury-time winner completed a superb comeback from Napoli as a 2-1 victory gave new boss Walter Mazzarri the most enthralling of starts. Having gone behind to Adailton's first-half free-kick, Fabio Quagliarella levelled for the home side midway through the second half. The game looked to be petering out and heading for a draw until Maggio found himself perfectly placed to tap in a dramatic late winner and hand his new boss a winning start. Antonio Conte celebrated his first win as coach of Atalanta with two eye-catching goals helping them to a 3-1 victory at Udinese. Simone Tiribocchi put the Nerazzurri ahead in the fourth minute, but Francesco Lodi brought the home side level shortly after. Udinese were the brighter team, but without Italy international Antonio Di Natale, who was surprisingly left out of the starting XI, they were unable to find the back of the net again, and they were punished by two goals worthy of winning any game. Jaime Valdes scored the first after 70 minutes before Diego De Ascentis sealed the win three minutes later. Jorge Martinez headed an 87th-minute winner for Catania as they claimed their first league win of the season, beating Cagliari 2-1. The Sicilians had gone ahead through Adrian Ricchiuti after 37 minutes only to see their advantage pegged back on the stroke of half-time by Daniele Dessena's acrobatic overhead volley. Catania looked set to go without a league win for the ninth consecutive game until Uruguay international Martinez popped up at the end to head home substitute Takayuki Morimoto's perfectly-weighted cross. The win moves Catania out of the relegation zone and level with Cagliari on seven points from eight games. Bari held firm in the face of sustained pressure from Chievo, with keeper Jean Francois Gillet to the fore as they claimed a hard-earned three points from a 2-1 victory. After Sergio Almiron's early goal, Bari had to weather strong pressure for the remainder of the first half. Andrea Ranocchia then doubled their lead against the run of play and substitute Erjon Bogdani's header was a mere consolation goal for the Flying Donkeys. Livorno's season of struggle continued as they let slip a 1-0 lead to lose 2-1 to Palermo at the Stadio Armando Picchi. The hosts went in front through Tomas Danilevicius' goal nine minutes into the second half but the Rosanero hit back quickly through Fabrizio Miccoli and Federico Balzaretti snatched the winner nine minutes from time. Vittorio Russo's Livorno have now gone eight Serie A games without a win from the start of the season and they are now two points behind Siena at the bottom of the table. For Walter Zenga's Palermo, it was a first away win of the campaign and a second successive victory after they beat Juventus prior to the international break. An early goal from Valeri Bojinov enabled Parma to maintain their recent fine form with a 1-0 win against Siena which saw the visitors slide into the bottom three. The hosts, who have now lost just one of their last five games in Serie A - a run which has also seen them beat Palermo and Lazio, secured the three points courtesy of Bojinov's sixth-minute strike. Siena rarely looked like registering their second win of the season and any hope of a comeback effectively ended as early as the 34th minute when Michele Fini was dismissed.